Tomorrow, Coco, Otis and SuperDad are going to soft play. I am getting a day TO MYSELF. I know it’s not great form to start blogging, and then the next day start boasting about having a CHILD FREE DAY, but you know, these things come around once in a blue supermoon so I’m going to be making the most of it! I intend to lie in past 8am (OH THE UNBRIDLED JOY), do my roots (for I will have peace and quiet, and no toddler around my ankles asking to do a wee right next to me, nor a manic boy assaulting me by throwing the nearest toy he can reach AT MY FACE), and take a looooong wander around Bluewater, taking in shops and coffee shops and start to *properly* plan this blog thang with a HOT latte and a blueberry muffin that I SHALL NOT SHARE. I’m quite excited, as you may well be able to tell. But anyway, as SuperDad well knows, when the children are not with me, in fact even more so than when they are not, I am quite particular over what they wear, and need to know that what they are swearing is activity and weather appropriate. And, you know, GOES. I have a picture of a 1yo Coco in a fluoro orange top, rainbow striped leggings and red trainers when SuperDad dressed her…. And so SuperDad is being just that, and taking the two crazies to a soft play nearby to meet one of his friends. Knowing that whatever he picks to put them in will Just Not Be Right, he asked me to pick an outfit for Coco. To be fair, the outfit he chose for Otis passed muster – Rolling Stones tshirt, loose shorts, socks and his new trainers (with a spare Beatles tshirt in case he gets the Stones one dirty. Which he will). To my mind, soft play outfits need to be comfortable, put up with wear and tear, be decent enough so they look vaguely presentable, and probably bright enough so that they can be identified from afar when, inevitably, Coco decides that TODAY is the day she is going to attempt to climb to the very top of the massive slide and throw herself down head first. So for Coco, no skirts or dresses – must be trousers or leggings. 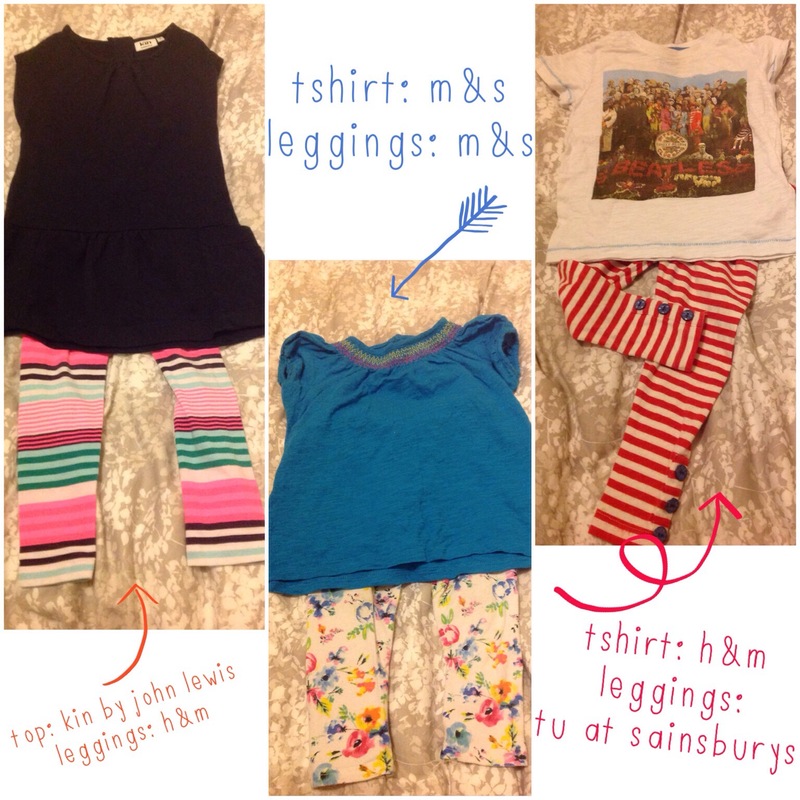 I find H&M a winner for leggings – I think the stripey ones above were £5.99 last winter so great value. They always have such brilliant prints too – Coco has some from last year that we called her “space cat” leggings, and I loved the print so much I bought her a dress in the same fabric…! I’m sure both the leggings and the dress will feature on this blog at some point in the future. I loved the blue tshirt from m&s here all this summer – it came in a multipack with a bright pink, grass green and a white one – lovely and cool for summer, and they are still big enough that they will layer well over winter, and probably (hopefully) fit next year! The black top by kin at john lewis is also a favourite here – Coco loves pockets, and is as comfy as hell. I love the minimalist styling too, and have been lusting over a number of items of theirs recently. Lets just hope that she doesn’t need all three outfits, and if she needs more than one, my husband at least remembers which tshirt goes with which leggings…. PS Can I be completely honest? I really hate soft play. It’s smelly, busy, expensive, and there’s always that 6yr old kid who wants to play with the baby toys which means my kids can’t. And, unforgivably, they sell WEAK TEA. My husband is the same at picking them clothes out, I’ve been training A to choose well for himself. He manages 99% of the time now. Poor baby girl stands no chance if my H has free reign.